New York — US gasoline prices continued to rise Thursday as downed refineries tightened supplies in the US Gulf Coast and the Atlantic Coast. NYMEX September RBOB settled at $2.1399/gal Thursday, up 25.52 cents/gal, and up more than 50 cents from August 22, before Texas coastal refineries began shutting down ahead of Harvey. Physical New York prices were higher as well. New York barge delivery RBOB was assessed by S&P Global Platts at a 44-cent/gal premium to the October RBOB contract, compared with a 30-cent/gal premium Wednesday. Colonial Pipeline, which is able to ship 1.37 million b/d of gasoline o//n its Line 1 from Houston to Linden, New Jersey, said deliveries will be "intermittent and dependent on refinery supply." Roughly 3.04 million b/d of refining capacity remains down in Texas, or 16% of US capacity. Assuming refiners cutting runs or in the process of returning are at 50% of capacity, the total downed capacity rises to 4 million b/d, which is 22% of the US total. Motiva is preparing to start up its 603,000 b/d Port Arthur, Texas, refinery -- the nation's largest -- once flooding from Harvey subsides, but was unable to provide a firm timeline for when that would be. With so much Texas refinery capacity offline, it is important to keep Louisiana refiners running to feed local demand and the Colonial Pipeline. The US Strategic Petroleum Reserve will release a total 1 million barrels of crude to Phillips 66 for its Lake Charles, Louisiana, refinery. The plant is running normally, and likely sought an SPR release to help bolster crude supplies constrained by weather-related port closures. * Jet fuel differentials in the Gulf and Atlantic coasts spiked Thursday as supply problems continued to plague markets, reaching levels not seen since Hurricane Ike ravaged the Gulf Coast in September 2008. S&P Global Platts assessed benchmark Gulf Coast 54 grade jet up 5 cents at NYMEX October ULSD futures plus 25 cents/gal, highest since September 18, 2008, when it reached plus 40 cents/gal. On the supply-starved Atlantic Coast, New York Harbor jet on Buckeye Pipeline rose 14 cents to NYMEX September ULSD futures plus 42 cents/gal, highest since reaching plus 55 cents/gal on September 17, 2008. * The refinery outages and port closures have largely been bearish for US crude prices, as more crude is placed in storage. The NYMEX front-month crude price discount to the second month has widened to 73 cents/b Thursday from 16 cents/b August 21, likely because crude inventories are rising at the Cushing, Oklahoma delivery point. TransCanada has shut down the southern leg of the 600,000 b/d Keystone crude oil pipeline, which carries crude from Cushing to Texas area refineries. Cushing stocks at 57.23 million barrels the week ending August 25 were at 73% of working capacity, US Energy Information Administration data shows. Magellan's BridgeTex and Longhorn Permian-to-USGC pipelines are down, so more Permian Basin crude is likely heading to Cushing. Permian crude prices are weaker as a result of the Magellan outages. WTI Midland was assessed at a $1.35/b discount to Cushing WTI Thursday, from a 50 cents/b premium August 21. * The Texas Gulf Coast is home to 4.944 million b/d of refining capacity, while the Louisiana Gulf Coast is home to 3.696 million b/d of capacity, according to the US Energy Information Administration. Total US capacity is 18.557 million b/d. * The US Strategic Petroleum Reserve will release 1 million barrels of crude to Phillips 66's Lake Charles, Louisiana, refinery as an emergency exchange in response to Harvey supply disruptions. 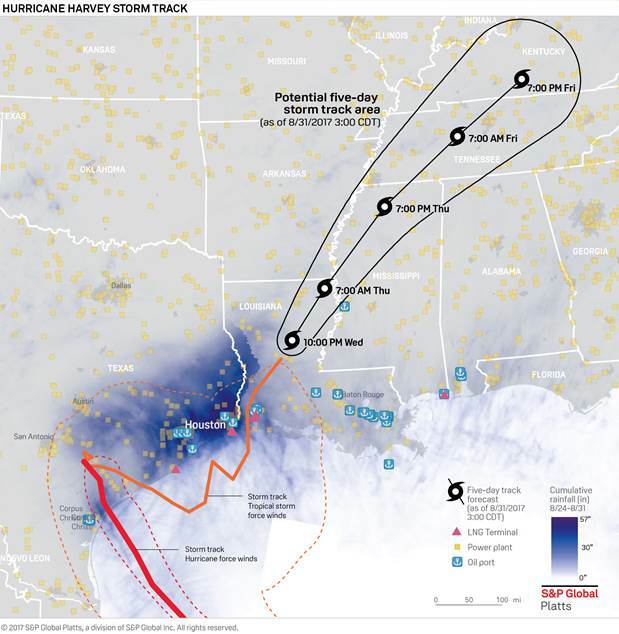 In two releases, the SPR's West Hackberry, Louisiana, site will a total of 400,000 barrels of sweet crude and 600,000 barrels of sour crude. * The US Environmental Protection Agency Thursday expanded emergency gasoline waivers to include 38 states and the District of Columbia to prevent storm-related supply disruptions across the country as concerns mounted about Gulf Coast refining capacity. The agency waived through September 15 requirements for reformulated gasoline and low-volatility gasoline to 26 additional states. Previous waivers targeted gasoline markets in the South, Southeast and Mid-Atlantic regions. The latest waiver added Connecticut, Maine, Massachusetts, New Hampshire, Rhode Island, Vermont, Delaware, New Jersey, New York, Pennsylvania, West Virginia, Illinois, Indiana, Iowa, Kansas, Michigan, Minnesota, Missouri, Nebraska, North Dakota, South Dakota, Ohio, Oklahoma, Wisconsin, Arkansas and New Mexico. EPA said the sale of E15, gasoline with up to 15% ethanol, must continue to comply with federal rules. * NuStar Energy has brought back online its North Beach crude oil and refined products terminal at Corpus Christi, Texas. With power being restored NuStar has been been able to start up its terminal in stages, spokesman Chris Cho said, noting its Texas City Terminals and Houston Asphalt Terminal still remain shut. * The Texas port of Corpus Christi is still targeting September 4 for a return to normal operations, spokeswoman Patricia Cardenas said Thursday. The port remains closed -- to all but limited inner harbor traffic -- for damage assessments and while the US Army Corps of Engineers surveys shipping channels. Initial assessments over the weekend found "light to moderate" damage and debris from the storm, she said. On Tuesday, the port reopened its inner harbor to barges and tugs with drafts no more than 20 feet. * The US Coast Guard said Wednesday that as of 2 pm local time (1900 GMT), the ports of Houston, Texas City, Galveston and Freeport were reopened, but with a few restrictions. Vessel draft can't exceed 33 feet for the ports of Texas City, Galveston and Freeport, while vessel draft can't exceed 37 feet for the Port of Houston, the statement added. All vessel traffic is limited to daylight hours. At current drafts of 33 feet to 37 feet, most tankers -- clean or dirty -- will not be able to transit the Houston Ship Channel until the restrictions are lifted. * Colonial Pipeline, the biggest US refined product pipeline, continues to pump products east from Lake Charles, Louisiana, despite problems with its facilities in Texas resulting from Hurricane Harvey. "Deliveries will be intermittent and dependent on terminal and refinery supply," the company said. Colonial is aiming to restart pumping of gasoline and distillates from Houston and Beaumont, Texas, from Sunday. The Colonial system runs from Houston to Linden, New Jersey, and supplies about 60% of the incoming supply of gasoline into the Atlantic Coast. Colonial has the ability to ship 1.37 million b/d of gasoline on its Line 1 and 1.16 million b/d of middle distillates on Line 2. * The Explorer Pipeline hauling refined products from Texas to Illinois closed midnight Tuesday to allow product to back up at the start of the line and enable faster deliveries at the northern end. The line should reopen sometime before Friday. * Harvey's impact on the US Gulf Coast has already delayed millions of barrels of oil product cargoes bound for Latin America, and fostered worries about further delays and increasing prices. Mexico, a large buyer of US Gulf Coast refined products, has turned to refineries along the Canadian and US Atlantic coasts for fuel supply. A source with knowledge of Mexican imports said the country has been looking to purchase gasoline "everywhere" and that it still needs more imports to satisfy its supply needs. * Medium Range tanker freight rates west of Suez have surged, with demand for gasoline shipments westwards the key driver. Europe will now have to provide clean product to markets the US Gulf normally supplies, such as Latin America, Brazil, Argentina and even the US West Coast, in addition to gasoline for US consumers. * Harvey-related gasoline shortages may start to appear in the US by Friday and get exacerbated by the high-demand Labor Day holiday weekend, fuel marketers trade group SIGMA said. SIGMA CEO Ryan McNutt expects the group's members to have serious supply challenges in the coming days. "Price isn't going to be the main issue," he said Wednesday. "There's just not going to be product, and unfortunately we're going into one of the busiest traveling weekends for that." down from 428,568 b/d Saturday. * Oil operators in the onshore Eagle Ford Shale in South Texas began to restart wells and related midstream facilities. Marathon Oil and EOG Resources were inspecting and assessing their Eagle Ford Shale operations in South Texas on Tuesday and have begun to restart production where possible. BHP Monday said it was ramping up production in the Eagle Ford. Before the storm hit, the Eagle Ford was producing about 1.341 million b/d of oil, and 5.1 Bcf/d of natural gas, according to data from Platts Analytics' Bentek Energy unit.